2010 Parents' Choice Award Gold Winner - highest honors! Acuity - The Maverick New Game of Sharp Vision & Keen Thought! 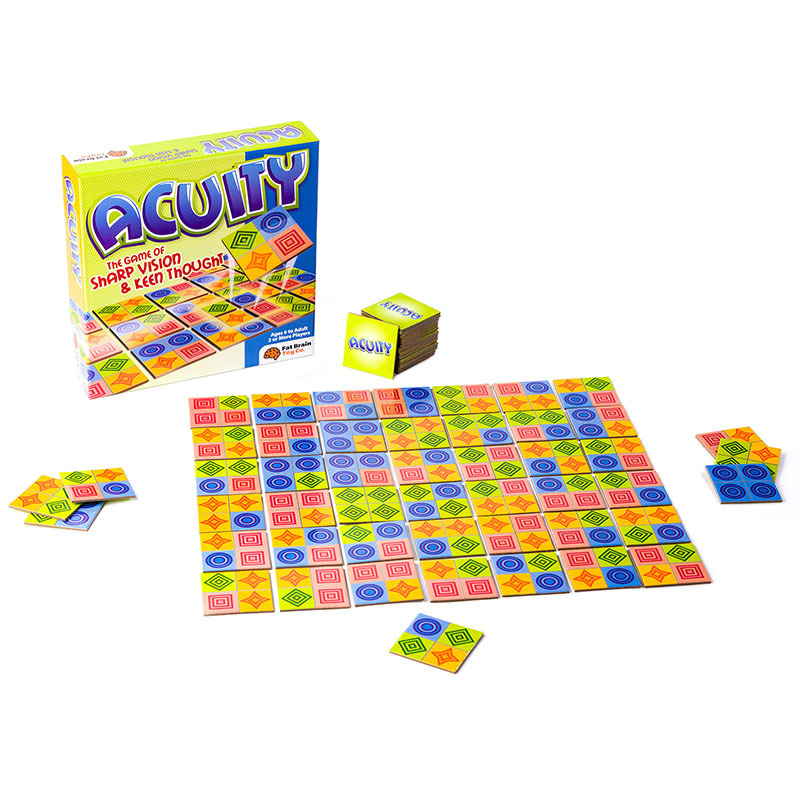 For reinforcing visual spatial skills, pattern recognition, and quick mental processing, Acuity is a brilliant choice! -And full of new zest too! Acuity is a fun, brainteasing game unlike any other you've seen before. Acuity is the clever matching game of quick visual perception where players race against each other or work together to discover and match hidden patterns in the tiles' arrangement. First, 70 wonderfully durable and vibrantly mind-bending pattern tiles, are set in a grid arrangement of 36 tiles. Your job will be to find a match. Here's the kicker. None of the tiles match. Not one. All 70 are different. Sooooo that means to find a match, players must find two side-by-side tiles that together, by looking at 2 adjacent squares on each - would match the tile that you're hoping to match. Or- alternatively, players could find the matching pattern by looking at the corners of 4 tiles together. *If you can't see a match, you can turn one tile one quarter of a turn to make one. It's easy. Easy until your mind's eye tricks you! It's the surprise in finding a match or thinking you've found a match (when you really haven't) that makes Acuity a one-of-a-kind, long-lasting source of fun game play over time. Acuity is never, ever the same game twice. Really. Not ever. Featuring 70 wonderfully durable and vibrantly mind-bending pattern tiles, Acuity will delight all ages. With simple rules, Acuity is a game the entire family can play together. No reading required... simply the ability to flip, turn and match! ·All minds on board to master the match!